I don’t know what part of the country you are in but we are in the South and boy is summer time in full swing here with temperatures in the tripple digits! When most folks think of Gingerbread they tend to picture a snowy winter day near Christmas time and baking the Gingerbread treats and houses but not us here at Gingerbreadfun, why not have a frozen Gingerbead Man of Gingerbread Woman on a stick for a summer time treat! 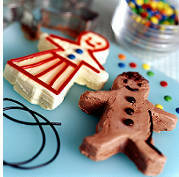 Check out the neat frozen Gingerbread recipe we found: Details here at Family Fun.